Volatility in the stock market and questions about the practices of major banks have many people seeking new investment options. Increasingly, investors are critically evaluating the social and environmental impact of their choices. Finding investments that achieve strong financial, environmental, and social returns, however, is challenging. This article introduces two areas of focus for so-called “impact investors” — local and social enterprises — and three financial vehicles for accessing these markets: direct investments, loans, and public equities. As background, impact investing is not assured by relying on a socially responsible investing (SRI) label. In many SRI funds, managers screen out certain types of businesses (oil, tobacco, fast food, etc. ), but don’t consider the positive impact (if any) generated by the businesses in which they ultimately invest. While a negative screen will disqualify certain companies, it does not necessarily drive beneficial social or environmental change in a significant way. In contrast, locally owned investing (LOI) and social enterprise investing (SEI) provide a sharper focus for impact investors. LOI can be attractive as a strategy to retain capital within one’s community – be it a neighborhood, city, state, or region – by injecting cash into locally owned independent businesses. This creates a multiplier effect as profits and working capital circulate locally. SEI moves beyond negative screening and seeks to support enterprises that generate financial, social, and environmental returns. In recent years, there has been tremendous financial innovation in the impact investing space. Three of the more mainstream vehicles that give investors access to LOI and SEI opportunities are: direct investing, loan funds, and public equities. In Port Townsend, WA, a group of citizens started the Local Investment Opportunities Network (LION). They invest only in locally owned businesses in East Jefferson County. There are no qualification requirements for an investor except a pre-existing relationship with the business owner seeking capital. LION acts as a social platform, hosting member-only gatherings for investors and business owners to discuss ideas and opportunities. Approximately 95% of the businesses are looking for loans (5% are seeking equity). Because LION members engage in direct investments, without an intermediary, the investments generate higher returns than a bank CD and the businesses borrow below bank rates (most LION loans have interest rates of 5-8%). Since LION’s inception in 2008, none of its $2 million in loans has defaulted. Equal Exchange CDs finance a worker-owned co-op that runs the largest 100% “fair trade” company in the United States. The investment thresholds are $500 and a three year term. A $4,000 deposit (which is used as a loan guarantee to generate a line of credit) enables Equal Exchange to buy the entire annual crop from a third world farmer (five acres, supporting six-eight people). As of October 2011, the interest rate on this CD is 0.4% on a 36-month term, compared with Bank of America’s 0.6% rate for the same term. Thus, for $8 less in return per year for three years, an investment in an Equal Exchange CD keeps a family on its farm, improving its quality of life. While the CDs are not FDIC insured, Equal Exchange states that it has never defaulted on a loan during its 24 years of operating. Another example of a loan fund is RSF Social Finance, which lends money to social enterprises (both for-profit and not-for-profit organizations). The investment thresholds for its Social Investment Fund, a diversified direct loan fund, are $1,000 and a 90-day term. Interest is adjusted quarterly, and can be accrued, paid out, or donated to an RSF donor advised fund. The current interest rate is 1% annualized, which has not changed over the last 9 quarters (as of October 2011). Unlike bank rates, which fluctuate with the prime rate, RSF’s rates are based on quarterly pricing meetings led by investors and borrowers. In total, RSF has generated over $230 million in loans, and currently has $70 million deployed over 70 projects. According to RSF, it has a 100% repayment rate since 1984. Finally, One Pacific Coast Bank (which acquired ShoreBank Pacific in 2010) in downtown Portland is an FDIC insured bank, and currently offers a 1% return on a 36-month CD ($1,000 minimum deposit). 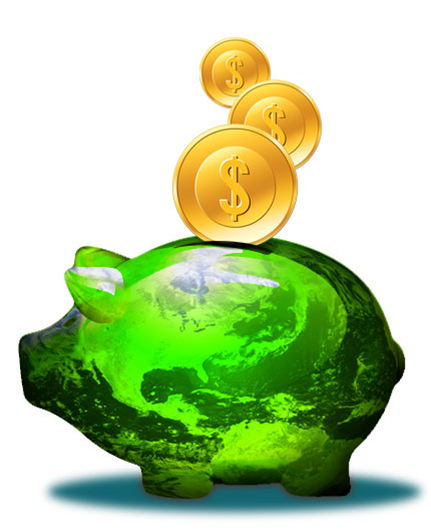 One Pacific Coast’s loan officers screen companies for environmental and social responsibility. Direct investments and loans enable investors to inject cash into a business. In contrast, investing in a public equity by purchasing shares of stock generally does not provide any new funds directly to the business. It simply triggers an exchange of ownership at the stockholder level. Investing in this way provides an important signal to the investment community and can lead to positive change through shareholder activism. For example, Portland’s Portfolio 21 mutual fund (^PORTX), employs negative screens, shareholder activism, and invests in businesses that are innovating to meet social and environmental goals. Portfolio 21 requires a minimum investment of $5,000 (or $1,000 for retirement accounts). For the socially conscious investor, finding opportunities to invest with impact can be an overwhelming endeavour. Fortunately, as businesses shift their strategies to generate environmental and social returns (in addition to profits), options for retail and accredited investors to infuse capital into such enterprises will expand. The job of concerned investors is to watch for these opportunities and to ask their financial advisors to do the same. Nathan Kadish developed his interest in impact investing based on experiences working with Oregon Business Council, Stand for Children, ShoreBank Pacific, and PwC’s management consulting practice. He coordinates the impact investing study underway at the Center for Earth Leadership. He’s a native Portlander and received his MBA from the Kellogg School of Management at Northwestern University. Nathan is not a financial advisor. The examples of investment opportunities in this article are to illustrate approaches only, and are not an endorsement or recommendation of any approach or product.